Garden and patio furniture may add plenty of appeal to our patio, however we should carefully choose it. It means that we should get the longest lasting and best looking furniture. There are a number of points to consider when choosing the right patio furniture. We should know whether the furniture is durable enough to withstand the weather and sunlight. This could depend on the material of the furniture. The size and color of the furniture could also determine the appeal of the garden and patio. If we are not sure that wood is durable enough, we could choose rust-free metal or plastic. It is considered more economical to purchase a furniture set. This is a better option than buying each component separately. Durability is an essential factor, especially because the furniture will stay outdoor. It may subject to various weather conditions, such as sun, wind, dust and rain. Even if the patio is covered, it is possible that the furniture is still exposed to various weather factors. If we purchase PVC furniture or the one with cheap plastic, we may need to replace it within 2 or 3 years. Cheaper furniture may deteriorate more quickly if left too long in the weather. Rust-free metal furniture is durable but, it requires sufficient attention. We may need to apply rust removal solution and repaint the surface. Wooden furniture is the most common, but it requires extra attention, especially in areas with wet climate. The type of wood could determine how much regular maintenance required. As an example, furniture made from pine could require maintenance task every year. Teak is more durable and it could require repainting after three years. Wicker furniture is also painted, but it usually doesn’t require too much attention and maintenance tasks. We should consider how much attention that we need to give to the patio and garden furniture. The color of the patio furniture is also essential to make sure that it will match with the rest of the patio. In order to retain the natural and proper grains of the timber, the wooden furniture may need to be oiled or stained. This should allow the furniture to blend properly with the patio and garden. Iron and other metal furniture should be painted to improve its durability. The right metal design should match quite well with our patio and garden. Wicker furniture should be left as is, in its natural state. 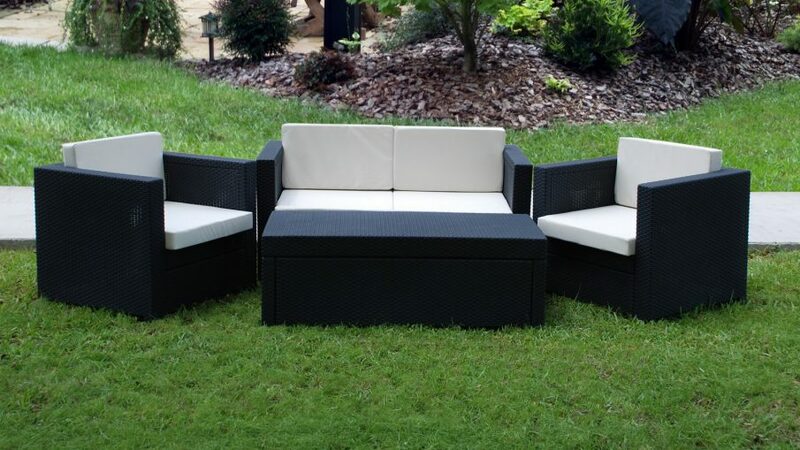 Wicker furniture, should provide tropical feel to the patio and garden. Again, the size we choose should be essential. Proper arrangement of furniture should allow guests to move freely in garden and patio. An easy way to do this is by arranging our furniture, using small pieces of paper on a map of garden layout. If space is limited, we may use fold up chairs and extendable tables. Our final choice should properly complement our garden and patio. As an example, in a garden that looks like a lush tropical area, wicker furniture is more appropriate.